An illustration of two merging neutron stars. This stellar collision created heavy elements such as platinum, uranium and gold. An international team of astronomers detected the first gravitational waves from merging neutron stars, and found proof they are the source of the universe's heavy elements, including gold and platinum. "This is a source we always thought we would see," said David Reitze, executive director of the LIGO observatory, which detected the cosmic ripples called gravitational waves, speaking at a news conference yesterday (Oct. 16). Stellar corpses called neutron-star pairs had been predicted before. "What came next, the emission of light across the electromagnetic spectrum revealed to us by a campaign involving 70 observatories, including seven space-based observatories and every continent on the planet's surface." Neutron stars are the corpses of stars more massive than our sun. At just 12-15 miles (about 20-25 kilometers) across and completely full of neutrons, a neutron star is so dense that a cubic centimeter weighs a million metric tons. When two neutron stars collide, there are two consequences theorists have predicted: The stars would generate the elements heavier than nickel and iron on the periodic table, and emit gravitational waves as they spiral inward. These cosmic ripples in space-time would take energy away from the rapidly orbiting stars, and eventually the neutron stars would collide and merge. The collisions would be the source of elements such as platinum, uranium and gold. The trick was to catch a pair of neutron stars in the act. That's where the Laser Interferometer Gravitational-Wave Observatory (LIGO) in the U.S. and the Virgo Interferometer in Italy came in. Once LIGO had spotted the gravitational waves, astronomers could turn their telescopes in space and on the ground to the region those waves seemed to come from, and pinpoint the source. That was the two neutron stars, located about 130 million light-years from Earth in an elliptical galaxy called NGC 4993, in the constellation Hydra. The gravitational-wave source was designated GW170817, named for the date on which it occurred (Aug. 17, 2017). 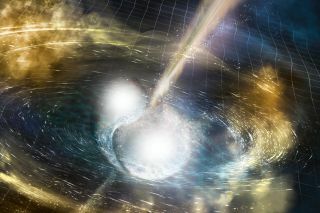 Neutron-star collisions would make "a highly radioactive fireball," said Nial Tanvir, of Leicester University in the U.K., who led the observing team that made the first infrared observations of GW170817 after the gravitational-wave detection. The theory, he said, was that in the violence of the neutron-star collision, heavier elements that form as subatomic particles are smashed together. The team saw the spectra of the neutron stars' infrared light revealed heavy elements, and that a lot of that material gets thrown free. "What happens to this ejected material, is it's going to mix with other gases in the galaxy," Tanvir said. Soares-Santos is lead author of the study outlining the first optical observations of GW170817. Scientists had already considered neutron-star collisions good candidates for creating some of the universe's heavy metals, but it wasn't clear how often such smashups occur and how much material they throw into interstellar space. Harvard astronomer Edo Berger, a co-author of the study led by Soares-Santos, said there's now an answer to the latter question: about 16,000 Earth masses, a tiny fraction of the total mass of the two neutron stars. "There's about 10 times the Earth's mass in gold and platinum alone," he said. (Gold makes up a total of about one-millionth of the Earth's mass, and most of that is in the planet's core). All of these heavy elements become part of the interstellar medium and eventually, a fraction end up as part of new planets. Berger said the new data doesn't mean supernovas don't make heavier elements, only that neutron stars seem to be responsible for at least a large portion of it. "With this neutron star channel, we don't have to rely on supernovas," he said. Tanvir said the formation of elements is in one sense a well-understood process. "We know that if conditions are right, this can happen," he said. This observation showed that neutron stars seem to have those conditions, he added. There are still some open questions, said Berger. "We don't know if this is a typical event, or if other ones in the future will produce more or less of this material," he said. Given estimates of how many such binaries are in the universe, and how much matter the neutron stars flung out, "It seems that we can account for all the heavy elements past iron." This includes the heavy elements we see on Earth, which would have come from the same process before being taken up in the nebula that formed our solar system. Once those elements were present in the neighborhood, they would have coalesced into asteroids which bombarded the Earth as it formed, delivering them to us. The heavy elements thrown out by this neutron-star pair 130 million years ago might eventually end up in new planets, as well. The fact that scientists could use both gravitational waves and light to characterize an object 130 million light-years distant will mean a new kind of astronomy, said Laura Cadonati, deputy spokeswoman for the LIGO scientific collaboration. "It's like the transition from looking at a black-and-white picture of a volcano to sitting in a 3D IMAX movie showing the explosion of Mount Vesuvius."